The doctrine of The Church of Jesus Christ of Latter-day Saints (“Mormons”) regarding Jesus Christ is in harmony with biblical teachings. 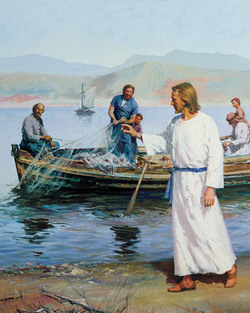 Given the Church’s nickname and associated belief in the Book of Mormon as canonical and in addition to the Bible, it could be easy to question whether Mormons believe in Jesus Christ. Confusion over this belief generally arises as differences appear between Mormon conceptualization of Jesus as compared with other Christian faiths, though both rely on biblical and extra-biblical authority. Other Biblical stories during and after Jesus’ life can be understood to explain Jesus Christ’s distinctiveness from the Father. At the baptism of Jesus Christ, the three individuals in the trinity were present: Jesus, in the water with John; the Father, whose voice was heard from heaven; and the Holy Spirit, who descended on the event in the form of a dove (see e.g., Matthew 3:13-17). The story of Stephen, the first martyr, likewise illustrates Jesus’ distinctiveness from the Father. From the book of Acts, just before Stephen’s death, one can read that “[Stephen], being full of the Holy Ghost, looked up steadfastly into heaven, and saw the glory of God, and Jesus standing on the right hand of God, and said, Behold, I see the heavens opened, and the Son of man standing on the right hand of God” (Acts 7:55-56, emphasis added). Confusion can arise from Jesus Christ’s teaching that He and the Father are one (see generally John 10:30). It has been pointed out that the word translated “one” is not in the masculine, but in the neuter gender, thereby expressing union without defining the precise nature of that union. Indeed, in previous verses Christ expresses His partnership with the Father and their unity in purpose. Christ’s teaching to His disciples at the Last Supper adds clarity to His understanding of His “oneness” with His Father. In His great prayer for the disciples, He asked “That they all may be one; as though, Father, art in me, and I in thee, that they also may be one in us” (John 17:21). In so asking, He was effectively imploring the disciples to strive for the same unity that He shared with the Father, and not a literal unity. These extra-Biblical creeds are not followed due to The Church of Jesus-Christ of Latter-day Saints’s unique belief in ongoing prophetic presence on earth and continuing scripture. The Book of Mormon: Another Testament of Jesus Christ is part of the Latter-day Saint canon of scripture and is fundamental to the Mormon concept of Jesus Christ. Likewise, present-day prophets affirm His divinity. That statement, oft-quoted by contemporary Church leaders, first made by Joseph Smith, articulates the Mormon view of Christ. That there are differences between mainline views of Christ, His origin, His nature, His purpose, is not in dispute. That the Christ of the Bible, affirmed in The Book of Mormon and in modern prophetic instruction, is the center of Mormon theology can likewise not be in dispute. ↑ See generally Shelley, Bruce L., Church History in Plain Language, 2d Ed., Word Publishing, 1995, pp. 99-108 et. seq. ↑ See generally Joseph Smith-History 1:17, Doctrine and Covenants 76:14. This page was last edited on 22 February 2012, at 01:18.